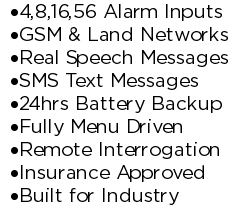 The M60 Alarm Autodialer is designed for the automatic transmission of alarms, events and signals from Critical / Remote / Unmanned sites across standard PSTN land lines and or (GSM\Mobile) phone networks. 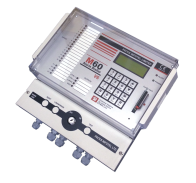 The M60 Alarm Autodialer is designed to operate under harsh industrial conditions & is currently in operation though out the world in various industries, including; Power Generation, Gas / Oil Stations, Building Management, Livestock Protection, Horticulture, Landfills, Water & Waste Control. The M60 is the latest and most advanced version of our Alarm Dialler systems we have produced since 1958, giving you the most up-to-date features and functions. The M60 introduced in 2017 replaces our popular “M30 Ultimate” Alarm Dialler. The M60 has been designed for Industrial Environments and comes complete with 4,8,16 or 56 separate alarm inputs each with their own individual user recordable speech or SMS message, GSM mobile communication, a fully menu driven LCD display, integrated 12 to 36 hour battery backup and 247 Remote Interrogation that allows you to phone in to check the current status of your M60 anytime day or night. The M60 Alarm Dialer is constantly being upgraded, with new features and software upgrades coming out every couple of months. To check out the latest developments please checkout our Blog or follow us on Twitter and Facebook. The M60 GSM Dialer Add on Module allows the M60 to use both the GSM (Mobile / Cell) networks and also the standard PSTN phone lines. The module allows the M60 to be used in situations where it is not practical or possible to get a land line fitted, or at a temporary site or location. The GSM Dialer Module can also function as a fail safe backup device, so if the land line is cut or fails it will automatically switch to the GSM Network. This is ideal for fail safe situations where you don’t want to rely on only the land line or GSM networks. The Module is designed as a separate unit with its own Battery Backup, so it can be fitted in the location with the best reception & comes with an inbuilt line sensing circuit to trigger an alarm call if the land line fails. Please Contact Us or check out the GSM Dialer Page for more information. Water Companies use the M60 to Remotely Monitor River & Reservoir Water Levels. County Councils use the M60 to Remotely Monitor Flair Stacks and landfill Gas Levels. Pharmaceutical Companies use the M60 to monitor their Fridge and Freezer Temperature Alarms. The Livestock Industry use the M60 to Remotely Monitor Poultry, Pigs and other Livestock Alarms. Large Buildings and London Skyscrapers use the M60 to Remotely Monitor their Building Management Systems. Technology Companies use the M60 to Remotely Monitor their Computer Rooms for Power Failure and Temperature Alarms. Please Contact Us or check out the M60 Applications page for more information. Follow the M60 Alarm Autodialer links above to find out more! How does the M60 Alarm Dialer Work? When an alarm or event occurs, the M60 Alarm Dialer transmits messages in the form of user-recorded voice messages, SMS or data using PSTN land lines and or the GSM mobile networks to the correct on call staff / security desk / management company etc. The recipients can receive messages or information via their telephones (land or mobile), pagers, computers and radio networks. The M60 can also be interrogated from any phone to check the current status of its alarm inputs. M60 Autodialler ADE Expander - allows the M60 to except up to 4 analogue inputs; these can be 4 to 20MA, 0 to 10MA, 0 to 20 MA, DC Voltage or Potentiometric transducers. M60 Autodialler Automatic Number Changes - The M60 will automatically change the Call out list depending on the time of day or night or whether it is a weekday or weekend. M60 Autodialler Channel to Roster - Each channel can be assigned a different call out list, perfect for where different personal are responsible for different alarms. M60 Autodialler Automatic Isolation Upgrade - The M60 will automatically turn its self on and off at user specified times & days. If you cannot find a feature you require of the M60, please contact us as we will be happy to develop it with you. Please Contact Us or check out the Optional Features for more information. A Packs Infotel Designed Product, 1 Broomfield hall buildings, London road, Sunningdale, Ascot, Berkshire, SL5 0DP, United Kingdom.